FREE DOWNLOAD: Connecting Training to Franchise Success. Learn the research behind franchise training, key challenges, and more! Hospitality and retail are extremely competitive markets. You can’t go anywhere to shop or eat where there aren’t multiple competitors within a five-minute walking distance. The mall is full of plenty of places to buy clothes. Restaurants are often grouped together in an area. There’s no hotel without another hotel just across the street. What key factors set these establishments apart? Many industry leaders agree that it’s all in the details – one of which is customer service. Most people have an instinct for how to be polite to others, but implementing best practices and ensuring that training strategy promotes consistency in great customer service is a key distinguisher in these industries. It’s not uncommon for people who write negative reviews to say they will not return to a service, restaurant, or store where they had a bad experience. In competitive markets, people don’t give companies second chances. They just find another place to spend their money where they feel cared about. Customer service needs to be consistent so that customers can receive the service they expect every time – not just sometimes. Good training is a way to ensure this consistency. Lots of companies are using technology to make their locations more efficient without hiring more workers. At Panera, you can order from a computer. You can purchase cupcakes via vending machines. There are restaurants where you don’t have to wait for the server to pay – you just pay at a table kiosk. Because of this use of technology, the ways that chains integrate the human touch has become more important and more strategic. Some companies are even using their lack of technology as a distinguishing factor in their services. If your company relies on human interaction, that human interaction is becoming a unique business factor that you can lean into to as part of your services. It also means that consistency in good customer service becomes that much more important, as it’s a part of your brand and your success. Chick-fil-A is the most profitable fast-food chain and they are also famously known for teaching their workers to say “please,” “thank you,” and “my pleasure.” The training worked – their workers do it over 95% of the time, while their competitors were in the 70s and 80s. Their senior director gives some credit to politeness when it comes to profitability. Publix, a grocery store in the South, is also famous for world-class service driving their two decades of high rankings in the American Customer Satisfaction Index. In a difficult sector that struggles with small profit margins, Publix has continued to shine, opening new stores and expanding to new areas all the time. It ranks No. 101 on the Fortune 500 list. Publix has also never laid off a single employee. It makes sense – it just feels better shelling out hard-earned bucks when someone is smiling while you do it. Consistency in general is good for profits. After all, your most devoted customers come to love what they expect at your locations. When it comes to customer service, it’s a key factor that can distinguish your company in customer satisfaction and feel-good vibes. According to this research paper on the importance of consistency in customer service, stores that excel in consistency “understand that sustained execution requires more than just operations manuals and a full complement of staff”. Because retail and hospitality stores can span across nations, it’s difficult to create a well-linked mission. We can use technology to link training between stores and unite the philosophy and mission of those working there. Consistency cannot be expected if employees are trained once and never return to the material. But, you can’t exactly afford to have employees attend hours-long trainings on a regular basis. 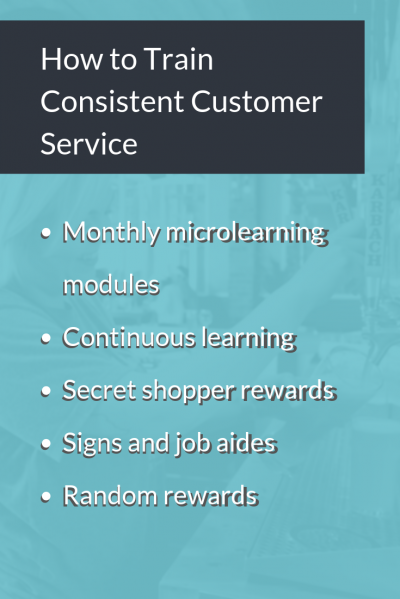 Monthly microlearning modules, which involve only a few minutes at the beginning of a shift, can help employees refresh on customer service concepts. The modules can rotate their focus and include a quiz. If you really want to motivate employees to pay attention, allow them to enter a raffle for a small prize or gift card if they get all the questions right. In any continuous learning courses – such as leadership or management training – it would be worth reinforcing customer service best practices and teaching employees how to reinforce those behaviors in those they are supervising. Through continuous learning, you can also guide employees on a career path that will help them feel more invested in the goals of the company. Surround your employees with reminders of what it means to be great at customer service. Paste them above the time clock. Put posters in the break room. Publicly display photos of employees who have been a great example of customer service. It will be more difficult to forget the company’s best practices for talking to customers at the register when they see it every single day. Give supervisors the ability to recognize an incident of great customer service with a small gift card or lunch on behalf of the company! The rewarded employee will be sure to repeat the behavior and others will notice and start to imitate this great example of customer service. For reward ideas, check out our download with 30 unique ideas for gamifying and incentivizing learning. GOOD LUCK WITH TRAINING CONSISTENT CUSTOMER SERVICE! I hope this article helps you understand how consistent customer service can benefit your company and the ways that you can achieve that through training. This guide, produced in cooperation with Brandon Hall, contains research and information related to the role of training in franchise success, key franchise training challenges, and more.